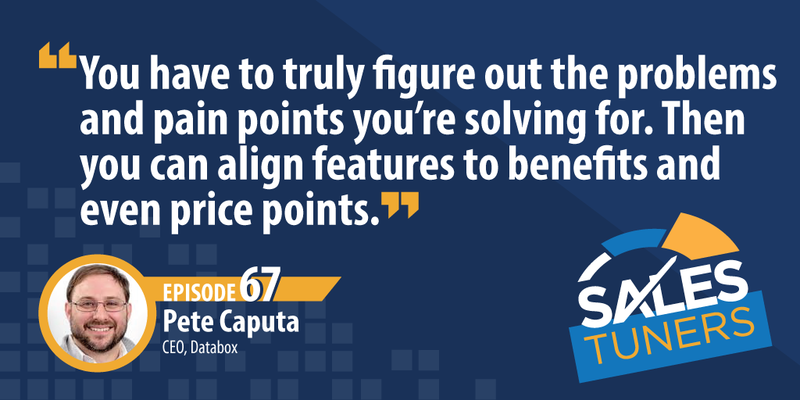 Pete Caputa, (@pc4media) CEO of Databox, was an engineer turned marketer turned sales leader to now running an organization focused on helping companies track performance. Pete is most well known for starting and building HubSpot’s agency channel program which is now a $100M+ business. An engineer by trade, Pete would go into sales conversations explaining things to people thinking they would buy. He quickly found it didn’t work and ended up hiring a sales coach who seemingly changed his life. He encourages salespeople to learn best practices through coaching that they can apply to their job. Like many people, Pete didn’t start out doing what he loved. He didn’t see a path to doing what he was passionate about. Once he started setting goals and implementing short-term plans, he was able to align his work and his passion. Looking back on his experience, Pete’s main goal was always helping customers solve their problems. By first positioning his vision and then focusing on building something together as a team, he knew he could accomplish more — and he did. Trial and Error: In the absence of data in the early days, you have to lean on good selling principles. What does that mean? The only thing prospects care about are their problems — not yours. You have to work diligently to understand your buyer and figure out how they talk about their pain points. Doing so will allow you to test different positioning statements and align your features not only to their pain points but also to your own price points. Qualify with Goals and Challenges: Qualifying with BANT may be the least enjoyable conversation for a prospect — especially when it’s done too early. Oftentimes, prospects will lie to you to either get off the call or lie to you to keep you on the call (so they can steal information from you). By leading the conversation around what their goals and challenges are, you’re able to better determine whether you should continue having a conversation. Quit Thanking Prospects for their Time: If you’ve uncovered a real challenge or helped a prospect identify a plan to get them to a goal, why would you thank them for their time? Think about it, if they got more out of the call than you did, shouldn’t they be thanking you? The idea behind this is to maintain equal business stature as opposed to thinking you’re less than them.